A West Texas company received approval Wednesday to pump water from the Capitan aquifer and pipe it to the Permian Basin where it will be used in oil and gas operations. The permit approved by the Culberson County Ground Water Conservation District allows Agua Grande to export up to 6,000 acre/feet of water per year, or roughly 1.9 billion gallons. Agua Grande – owned by oilman Dan Allen Hughes, Jr. – intends to pipe the water nearly 60 miles northwest to the Delaware Basin where it will be used in oil and gas operations. The Delaware Basin is part of the prolific Permian Basin, one of the country’s most productive oil fields. According to the company’s application, there are approximately 20 oil and gas companies that have already expressed interest in buying the non-potable water. The list reflects some of the largest companies operating in the Permian Basin today, including Midland-based Concho Oil and Gas. The permit, filed in March , cites hydrology and engineering reports that claim operations will not affect nearby wells on other properties. But that didn’t appease area farmers, ranchers and environmentalists who attended hours-long hearings in June and August to voice their concern. The company says their pumping won’t have any affect on the nearby San Solomon Springs, which feeds Balmorhea State Park. But some experts say the aquifers in West Texas aren’t fully understood yet and it’s uncertain how activity in one might affect another. Many in the area are quick to bring up the case of the famed Comanche Springs in Fort Stockton which after 1947 were all but dry, after significant pumping from the Edwards-Trinity Aquifer. By 1961, the springs stopped flowing altogether. Originally, the board planned to review the permit at an earlier hearing in June, but tabled the decision to receive more information and public testimony. At both hearings, questions of the district’s legal bounds were brought up. 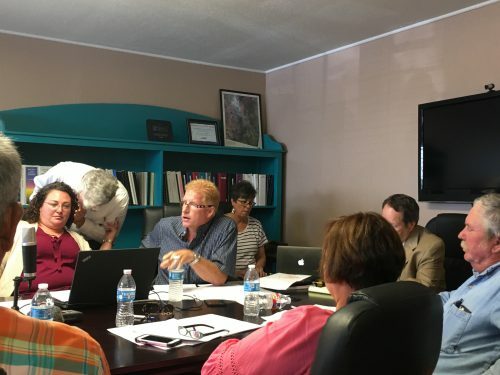 The district and Apache Grande’s counsel suggested the board couldn’t legally deny the permit based on the potential affects the pumping would have outside the district. Legally, they said, the board’s purview is confined to its district itself. With the permit approved, the company says they will begin construction by the end of the year and begin pumping water in 2018. This entry was posted in KRTS News, KXWT News and tagged Agua Grande, Culberson County, Groundwater. Bookmark the permalink.